Who doesn’t like a warm deep fried snack to have it in tea time? Today i made this as a tea time snack.This Potato Bondo is a very tasty and taste bud tickling food. It’s a perfect tea time snack. 1. Combine the Bengal-gram dal flour, rice flour, chilly powder, baking soda powder, and salt by adding enough water to make it a thick batter which pours heavily from a spoon. Beat up the batter for 2 minutes and keep aside. 3. In a wide mouthed pan, heat 2 tsp of oil and splutter the mustard seeds. Add the green chilies and sauté for a minute. Add the onions and saute till translucent.. Add the turmeric powder, salt, coriander leaves and mix. Set aside to cool and squeeze half a lemon into the mixture. 6. Remove them to a dry plate. Serve hot with any of your favorite chutneys and enjoy! Suma has showered with this lovely Award.. 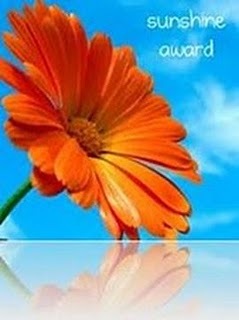 I am so pleased with the award that I received from Suma Thanks for sharing this one dear! that platefull looks so good, akka! Am drooling over that plate Akka...superb crispy bonda looks fantastic.. I have made only once,a filling snack! 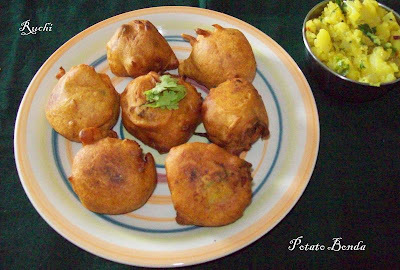 Just pass that plate to me..love aloo bonda..tempting!! The bonda looks perfect! I like it. It has been a long while since I made some.